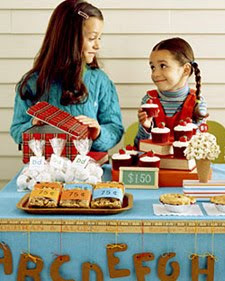 Dawn writes, "my 10-year-old daughter and her best friend are having a bake sale to raise money for our local library. The library has agreed to let the girls have a sale on their front lawn. We have many families contributing baked goods, and it's up to me to make sure everything looks great the day of the sale. Any ideas?" I've always loved this story from MS Kids. (I wish there were more pictures from the story on their site, I'll have to track down my back issue). Yummy!! I want it now.